Background and Objectives: In Saudi Arabia, overweight and obesity affect more than 75% of the adult population. National studies concluded that the two most contributing factors leading to obesity epidemic in Saudi Arabia are intake of imbalanced diet and lack of regular physical activities. The purpose of this paper is to study the trial of weight loss and the factors that determine it among adult overweight/obese in Abha city, southwest Saudi Arabia. Materials and Methods: This cross sectional study was conducted in Aseer Mall, Abha city during August 2014. To achieve the objectives of this study, the investigators created a questionnaire in Arabic language with the following parts: demographic data, history of any medical condition, awareness about current weight, awareness about harm of obesity, past trials to lose weight, types of interventions to lose weight, and results of trial. The questionnaire was validated by two family physicians and then administered by well-trained nurses to all adult people visiting to “Obesity Exhibition” which was executed by Saudi Arabian society of metabolic and bariatric surgery (SASMBS) in August 2014 for 1 week. Data of the questionnaire were coded, entered and analyzed by SPSS. Results: A total of 422 clients visited the obesity exhibition site during 1 week of the study. Out of them, 263 individuals (62%) were either overweight or obese. The mean age was 36 years; majority of participants were females (71%) and married (67%); housewives and officers constituted 27 and 29% of participants, respectively. About 85% of them knew their current weight, and 92% reported that obesity may give harmful effect on their health. More than 80% of the participants mentioned that they tried to lose their weight in the past, but about quarter (26%) of them reported its success. About one third (37%) of them used both diet and exercise; 3% of them used drugs, while 26% used traditional therapies as an intervention to lose weight. Most of participants (74%) fail to lose weight as they were not adequately compliant with diet and exercise. Average weight loss was 7.5 kg (standard deviation = 6 kg) and a minimum of 1 kg. It was found that females (27%) use herbal products to reduce their weight when compared to males (6%) (P = 0.000). Practicing a physical activity to lose weight was higher among males (31%) compared to females (19%), but no association was found with other demographic variables. Conclusion: Majority of obese patients failed to achieve the target weight loss. The underlying reasons for failure were poor compliance to diet and physical activities. With our recent research knowledge, we are unable to trace any local or national study about the trial to lose weight among Saudis who suffer from overweight or obesity. The purpose of this paper is to study the trial of weight loss and the factors that determine it among adult overweight/obesity in Abha city, southwest Saudi Arabia. This cross sectional study was conducted in Aseer Mall, Abha city, Aseer region, Kingdom of Saudi Arabia (KSA), during August 2014. To achieve the objectives of this study, the investigators constructed a questionnaire in Arabic language with the following parts: demographic data, history of any medical condition, awareness about current weight, awareness about the harms of obesity, past trials to lose weight, types of interventions to lose weight (performing regular exercise at least 30 min/day five times a week, intake low fat/low sugar diet and using anti-obesity drugs), and results of trial. The trial was classified as successful if an individual lost 10 kg or more in any past trial. The questionnaire was validated by two family physicians and then administered by well-trained nurses to all adult people visiting to “Obesity Exhibition” which was conducted by Saudi Arabian society of metabolic and bariatric surgery (SASMBS) for 1 week during the month of August 2014. “Obesity Exhibition” is an annual event that has been conducted for 1 week by SASMBS and it aims to educate the Arabian community about obesity and its harmful and negative impact. “Obesity Exhibition” not only includes audiovisual materials such as posters, films and details of health professionals who were checking weight but also educates individuals about prevention of obesity. Including criteria were adult ≥18-year-old with body mass index (BMI) ≥ 25 kg/m2 who accepted to participate in the study. Participants’ consent was obtained by investigators before conducting interview. Consent mentions the purpose of the study and its benefit in addition to keeping all the relevant data as confidential and to be used for research purpose in addition to voluntary participation. Weight and height were measured by a trained nurse using weight scale. Weight status was classified into the following categories by using BMI (weight (kg)/height (m)2 as follows: underweight (BMI < 18.5 kg/m2), normal weight (BMI = 18.5–24.9 kg/m2, overweight (BMI = 25–29.9 kg/m2), and obesity (BMI ≥ 30 kg/m2). Variables were coded, entered, and analyzed using the Statistical Package for Social Science version 16 (SPSS Inc., Chicago, USA). P-values were considered significant if those were <5%. A total of 422 participants visited the obesity exhibition site during the 1 week of the study. Participants of <17 years of age and with BMI <25 kg/m2 were excluded from the study. Out of them, 263 individuals (62%) were found to be either overweight or obese. The mean age was 36 years; majority of participants were females (71%) and married (67%). Housewives and officers represented 27% and 29% of participants, respectively [Table 1]. Regarding the risk factors and comorbidities among participants, back and joints pain were reported by (8%), snoring (7%), diabetes (3%), and hypertension (2%) while 17% had more than one problems. Generally, more than one-third of the participants suffer from at least one health problem in addition to overweight or obesity [Table 2]. [Table 3] shows that 85% of participants know their current weight, and 92% reported that obesity has harmful effect on their health. More that 80% of the participants mentioned that they tried to lose their weight in the past. More than one third of the participants practice both diet and exercise, and 3% used drugs while 26% used traditional therapies as an intervention to lose weight. Most of participants (74%) fail to lose weight due to poor adherence with diet and exercise. It was found that the prevalence of obesity among the participants of <30 year old was 30% compared to 70% among those of 30 year old or more (P = 0.00), and it was also found that males were obese (67%) compared to females (58%), but this difference was not statically significant (P = 0.2). Regarding the association between job and obesity, it was found that housewives, teachers, and soldiers were more obese (66%) compared with students (27%) (P = 0.007); however, marital status and educational status have no significant relationship with obesity (P = 0.12 and P = 0.13, respectively). It was found that there was a significant association between educational status and trial to lose weight; as the participants have higher education, they tried to lose weight (primary education, 55%, university, 83%) (P = 0.003). Younger participants tried to lose weight compared to older ones (89% vs. 79%) (P = 0.03), but there was no difference regarding trial to lose weight regarding gender (P = 0.44), or job. Average weight loss was 7.5 kg [standard deviation (SD) = 6 kg], with a minimum of 1 kg. It was found that females (27%) use herbals to reduce their weight compared to males (6%) (P = 0.000). Performing physical activity to lose weight was higher among males (31%) compared to females (19%), but no association was found with other demographic variables. Socio-demographic characteristics were found to have no association with the amount of weight lost by participants; gender (P = 0.144), educational status (P = 0.68), marital status (P = 0.34) and job (P = 0.4). This study revealed similar and high prevalence of overweight/obesity as reported previously by regional and national surveys.,, Regarding the associated morbidities, it was found that more than one third have chronic-related problems and 10% have two problems or more. These findings indicate the seriousness of obesity in Saudi community which needs anticipatory, comprehensive, continuous and multidisciplinary medical care. Most of participants (85%) were aware about their current weight, and 92% of them stated that obesity has harmful effect on health. These encouraging findings could be explained by that Saudi community becomes conscious about this emerging health problems either due to the effect of media or national campaigns which are executed by health sectors regularly during the last few years. Despite this fact, only 82% of the participants have had some past trial to lose weight, and <26% mentioned that their trial was successful compared to that of 32.4% reported from Riyadh. This findings emphasized that obese individuals in Saudi community have positive attitude to get rid of their excess weight, and such a practice should be stressed on by health professionals when obese individuals attended health care facilities. Participants with higher education were having trial to lose weight which indicated the positive effect of education on behavior and practice. The average weight loss among participants was 7.5 kg which is similar to results that were reported from Riyadh (7.8 kg) and New York (7.2 kg) but is higher than that that reported among obese women from Netherlands (4.4 kg), Mexico (4.7 kg), USA (5.6 kg), and Japan (3.7 kg). The average of weight loss in this study should be interpreted carefully because it may be affected by a recall bias among participants.Most of participants followed diet therapy or physical activity or both interventions to lose weight compared to only 3% who used medications alone. These results could be explained by that participants were aware that the healthy lifestyles is the first step in management obesity as recommended by most of obesity related societies and associations. About 26% of the participants mentioned that they use herbal medicines to lose their weight compared to 3% who use licensed drugs. This figure is lower than that reported among obese patients in Taif which was 98%. This serious finding needs to be given more attention by health professionals because some herbal medicines are unsafe and could cause serious side effects. 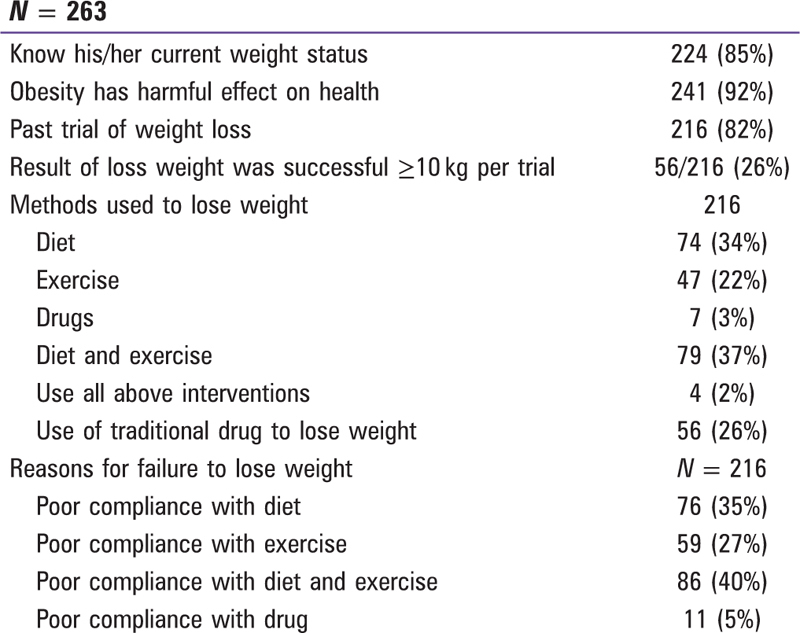 Majority of participants (74%) failed to achieve the target weight loss due to poor compliance with health diet and regular physical activities. In this regard, investigators emphasized that obese patients on weight loss program should be counseled and monitored regularly by their physicians to get good result of such an intervention. Despite good results of this study regarding high percentage of obese who had previous attempts to lose weight with acceptable figure, however, a recall bias cannot be eliminated which emphasizes and reinforces to repeat this study among large sample through prospective design. Results of this study revealed that majority of the overweight and obese patients have positive attitude to lose weight. Despite such a high trial to reduce weight, the success rate was lower than expected. This trial should be encouraged by health professionals, and the reasons behind high failure rate should be explored and managed accordingly. Memish ZA, El Bcheraoui C, Tuffaha M, Robinson M, Daoud F, Jaber S et al. Obesity and associated factors — Kingdom of Saudi Arabia, 2013. Prev Chronic Dis 2014;11:140236. Al-Baghli NA, Al-Ghamdi AJ, Al-Turki KA, El-Zubaier AG, Al-Ameer MM, Al-Baghli FA. Overweight and obesity in the eastern province of Saudi Arabia. Saudi Med J 2008;29:1319-25. Bin Horaib G, Al-Khashan HI, Mishriky AM, Selim MA, Alnowaiser N, Binsaeed AA et al. 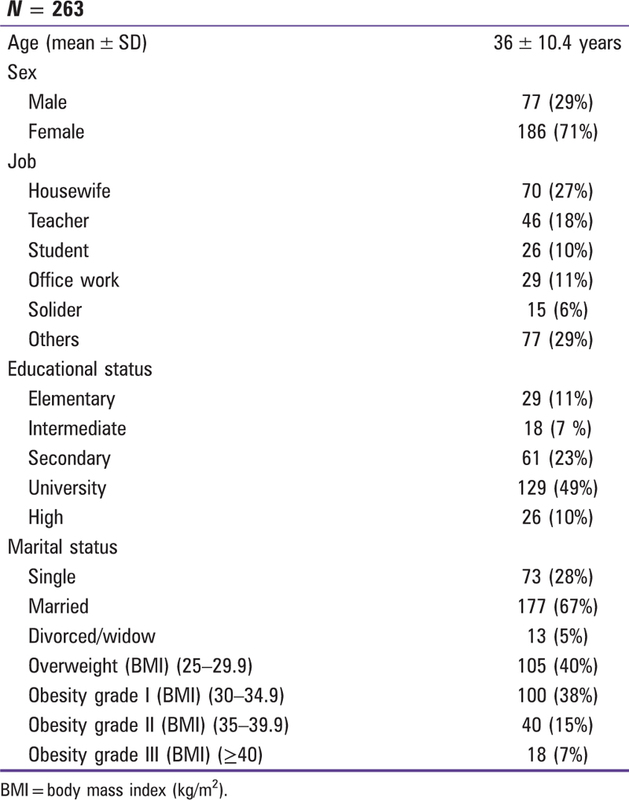 Prevalence of obesity among military personnel in Saudi Arabia and associated risk factors. Saudi Med J 2013;34:401-7. Amin TT, Al-Sultan AI, Ali A. Overweight and obesity and their relation to dietary habits and socio-demographic characteristics among male primary school children in Al-Hassa, Kingdom of Saudi Arabia. Eur J Nutr 2008;47:310-8. Al-Hazzaa HM, Abahussain NA, Al-Sobayel HI, Qahwaji DM, Musaiger AO. Lifestyle factors associated with overweight and obesity among Saudi adolescents. BMC Public Health 2012;12:354. Ganbi HH. The impact of obesity and weight reduction program with Xenical drug treatment on health status of obese adolescent girls in Saudi Arabia. J Am Sci 2010;6:944-58. Albassam RS, Abdel Gawwad ES, Khanam L. Weight management practices and their relationship to knowledge, perception and health status of Saudi females attending diet clinics in Riyadh city. J Egypt Public Health Assoc 2007;82:173-201. Al-Othaimeen AI, Al-Nozha M, Osman AK. Obesity: An emerging problem in Saudi Arabia. Analysis of data from the National Nutrition Survey. East Mediterr Health J 2007;13:441-8. Mutsaerts MA, van Oers AM, Groen H, Burggraaff JM, Kuchenbecker WK, Perquin DA et al. Randomized trial of a lifestyle program in obese infertile women. N Engl J Med 2016;374:1942-53. Armenta Guirado BI, Díaz Zavala RG, Valencia Juillerat ME, Quizán Plata T. Obesity management in primary care setting by an intensive lifestyle intervention. Nutr Hosp 2015;32:1526-34. Pownall HJ, Bray GA, Wagenknecht LE, Walkup MP, Heshka S, Hubbard VS et al. Change in body composition over 8 years in a randomized trial of a lifestyle intervention: The Look AHEAD study. Obesity (Silver Spring) 2015;23:565-72. Yamauchi K, Katayama T, Yamauchi T, Kotani K, Tsuzaki K, Takahashi K et al. Efficacy of a 3-month lifestyle intervention program using a Japanese-style healthy plate on body weight in overweight and obese diabetic Japanese subjects: A randomized controlled trial. Nutr J 2014;13:108. Eldalo AS, Alotaibi MN, Alenazi TO, Albogami HA, Mohamed KM. Use of herbal medicines in the treatment of obesity in Taif, Saudi Arabia. Saudi J Med Med Sci 2017;5:149-54.